Paper shredders are mechanical devices used to cut papers into shreds which could be either strips or fine particles. They are mainly used by businesses, government organizations, and private individuals to destroy private, confidential, or other sensitive documents. Important documents such as credit cards, tax documents, media discs, bank account statements, and bills are advised by privacy experts to be kept hidden from the public, or shredded if no longer needed. This is because criminals can cause a lot of damage with it if it falls into their hands. There are several kinds of shredders in the market ranging from small inexpensive hand units designed for few pages, to large expensive units used for commercial shredding capable of shredding millions of documents in a short space of time. The common shredders you’ll see around are those that are electrically powered although there are some that are manually powered too. They appear as special scissors with multiple cutting blades. These types of shredders are not common as before due to the availability of small sized inexpensive electric shredders capable of performing the same job more efficiently. The electric shredders available today are mainly classified into stripcut, crosscut, and microcut paper shredders. Stripcut shredders cuts document into long strips. Documents to be shredded using this type of shredder should be documents that are not highly confidential because a determined criminal might be able to rearrange the pieces given enough time. Crosscut shredders are an advanced version of strip cut shredders in the sense that they use double blades to cut unwanted documents diagonally. Crosscut shredders produce more shreds than stripcut making them more preferable. Microcut paper shredder is the best, even more efficient than crosscut as it is designed to cut unwanted documents into tiny shreds. Documents destroyed using microcut paper shredders would be impossible to reassemble thus making them the most ideal choice for highly confidential documents. Today, you will read micro-cut shredder reviews of 4 top shredders any of which would definitely be capable of handling varieties of shredding tasks in your office. 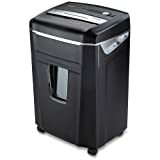 The AmazonBasics Micro-cut paper shredder is a top shredding machine capable of turning papers, CDs, and credit cards into tiny pieces. It has an auto start feature which allows you start the shredding operation simply by feeding the sheets into the machine. It also has a manual reverse feature which helps clear all forms of paper jam. These two basic features help ensure that you don’t have to monitor the machine while it’s working. All that is required of you is to feed in the paper and the machine does the rest of the job. To ensure that the machine lasts as long as possible, it is equipped with a thermal protection circuit of which the auto shut-off feature is a part of. What it does is to protect the machine’s motor from overheating when carrying out heavy operation. As soon as the machine senses abnormally high temperatures on the motor, a red overheat light indicator immediately turns on as the auto shut-off puts the machine into idle state giving it time to cool before returning back to its operation. Being able to shred at a speed of 6.56 feet per minute for a micro cut paper shredder is just awesome and this is complemented by its large waste basket which is capable of containing about 600 sheets of paper. This invariably means that you don’t have to pause your shredding every time to empty the bin. One reason why people opt for a shredding machine in their offices is because they want confidential documents destroyed beyond repair. The AmazonBasics microcut shredder does just that by using its blades to cut through the paper turning it into micro pieces which no one can successfully rearrange. It’s small size and weight makes it ideal for all offices whether big or small. The dimensions in inches are 26.0 X 16.34 X 11.81 with weight of about 25.8 pounds. It also has wheels attached to its base making it easy for you to change its position whenever you want. The Fellowes Powershred 225Mi is another efficient shredding machine capable of meeting all shredding demands in your office. No matter how much papers you have to shred, this machine is guaranteed to completely turn them all into pieces without jamming, thanks to its 100% jam proof design. For a machine as efficient as this, one would expect a bin capable of collecting a huge amount of waste, and that’s exactly what you get. The power shred 225MI is designed with a 16 gallon capacity bin which happens to surpass that of several other micro-cut shredders. As offices are expected to be quiet, the Powershred 225MI is designed with a silent shred technology which makes it as quiet as possible even in tough shredding conditions. Aside from its super-quiet shredding technology, there’s a new one called the Safe Sense Technology and what this does is to optimize your shredding experience by making the machine work with minimal touches. One reason why most people opt for micro cut shredders, rather than their “cross cut” counterpart, is because they want to ensure their privacy remains intact. You’ll be amazed at how much this machine can convert your documents into tiny particles that can never be remade. Shredded pieces are typically 5/68 by 15/34 in size which is about ten times smaller than that of cross-cut shredders. Although shredders are mostly used on papers, they can also be used to shred slightly tougher documents such as credit cards and compact discs. The Powershred 225MIdoesn’t just shred papers, DVDs, CDs, but will also shred staples comfortably. Being a machine that uses electric motor, one would expect it to consume a lot of energy especially at offices where shredding operations are frequently done. On the contrary, the machine is designed to be energy efficient so even if your office is such that shredding operations are done every single day, your electricity bill will still be reasonable. The size of the machine is one aspect that may give users concern because it happens to be bigger than other shredders. With dimensions of 29.38 X 17.75 X 17.13 inches and a weight of 92Lbs, fitting into a small office might be a problem. Its enormous work rate means it should be used in large and busy offices; but that doesn’t mean you can’t use it in a small and busy office. All you need is to create space! The Aurora AU1000MA Micro-cut paper shredder is a machine that is just as good as the other shredders you have come across. It is designed in such a way that you can use it in your office and also in your home. Its operational efficiency makes it a machine everyone wants to buy. Equipped with auto start and stop functions, you don’t need to push any button before the shredding operation starts. As long as the machine is on, all you need do is pass your sheet right through the opening in the machine and it immediately comes on swallowing all and shredding them immediately. To make your shredding experience fun and easy, the machine has LED indicators which notifies you of important situations such as overloading, overheating, opened door, overfull bin, and jam alert. Versatility is another feature this machine possesses. It is able to shred various types of documents such as papers, CDs, DVDs, Credit cards, Staples, and small paper clips. All these private documents will be shredded into documents just by feeding them into the machine. You don’t have to worry about the AU1000MA impacting on your energy bill as it is designed to save energy. The machine as a whole operates silently and quickly thereby making it consume less energy and apart from that, it goes off into idle state when not used within five minutes. For those not willing to spend in excess to purchase a shredding machine, this might be the best micro cut shredder for you. The fact that it is affordable doesn’t make it far less superior than its more expensive counterparts. The machine is just as silent and efficient as others. It also weighs less thereby making it a perfect fit for a small office. Finally, its self-protection features makes it last longer than expected. The machine automatically powers off as soon as it senses an un-shreddable item being fed into it. It also has the overheat sensor which protects its motor from being damaged by overheating. If you are looking for a top-notch document shredder renowned for robustness and efficiency then you need to have the Bonsaii DocShred C560-D on your radar. Designed to shred documents such as papers, CDs, DVDs, and credit cards, you have a machine that will surely protect your privacy as shredded documents can never be recovered. There are a host of features available with the C560-D shredder most of which are discussed below. The C560-D 6 sheet jam stop shredder is designed with the most attractive and durable materials such as high-quality steel blades, solid plastic, and a spacious waste bin. With materials of high quality as these, you can be rest assured that the shredder will continue to work for a very long time without developing fault. Companies that deal with highly confidential documents prefer to purchase microcut shredders because they don’t want confidential information getting into wrong hands. The DocShred C560-D just like other microcut shredding machines uses its properly positioned blades to cut papers into tiny particles that cannot be recovered. The dimensions taken by the pieces cut from this machine is 5/32 by 15/32 inches (4x12mm). A large bin is necessary for shredders that operate at fast speeds, or else, you’ll find yourself having to empty the bin more often than necessary. This machine comes with a 4.0 Gallon bin capacity which is ideal for its 6.2 feet/minute shred speed and 3 minute continuous run time. Another important feature everyone wants in a shredder is reduced or no noise. The C560-D offers just that with its library quiet motor powering the extra sharp blades to cut effortlessly through the papers. It is so strong and efficient that it’ll cut through 4 feet of paper in a minute or less. In order to reinforce your trust on this product, Bonsaii provides you with a one year warranty on all parts. The warranty helps keep you relaxed but doesn’t really mean you’ll encounter any fault within that time. With proper maintenance, it is possible you don’t encounter any fault within several years of usage as the machine’s durability is second to none. These four microcut machines are some the best you will find out there but as always, the problem is which should you choose? Before you make a choice, it is important to carry out a little survey of the office or company where the machine is to be installed. If it happens to be a very busy place, then you should opt for the largest shredding machine and that happens to be Fellowes Powershred 225MI. It has similar features with other top shredders, however, the distinguishing factor is its ability to swallow up 14 sheets of paper at once. Another notable difference is the 16 gallon capacity which is definitely one of the largest you’ll find for microcut shredders. If the shredding tasks in your company isn’t that much then it might be considered a waste of resources going for the Powershred 225MI. 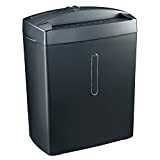 A better alternative is the AmazonBasics 12 sheet or Aurora AU1000MA 10 sheet microcut shredder. They are both efficient and ideal for medium range microcut shredding operations. 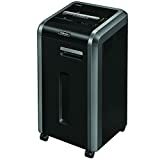 I would however prefer the AmazonBasics micro paper shredder simply because it is cheaper than AU1000MA and also has far superior positive reviews which proves that it has been tested and now it is trusted by many Amazon customers.